For many Washington-area residents, commuting can be a nightmare. They can share horror stories about being caught on broken-down Metro cars or waiting on a platform for what seems like ages because of delays somewhere in the system. Drivers can relate to familiar stretches of roads being turned into morning parking lots with nothing in sight but brake lights. But a small faction of commuters have found an alternative mode of transportation: Ditch the car keys and SmartTrip card and lace up those running flats. They run to and from the office, many hauling their work clothes, work items, and personal belongings in a backpack. Those who do it commonly turn to running commuting for one of two reasons: Finding a way to add mileage to their training or trying to fit running into their busy lives. For Francisco Parodi, it’s an issue of optimizing his time at home with his three children, who are 8 years, 4 years, and 10 months old. Depending on his route, it takes him between 45 minutes to an hour and 15 minutes to run from his home in Friendship Heights to work in Foggy Bottom. That’s roughly an hour longer he can spend with his family if he running commutes. 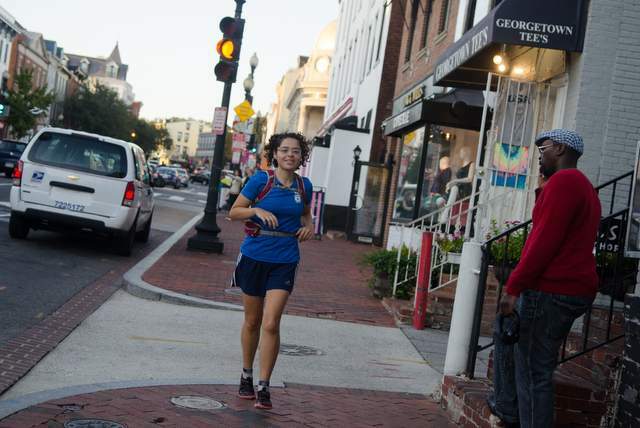 Patrica Chaupis uses the 3.8-mile trek from her Arlington home to work in Georgetown as a way to log more mileage and help her race longer distances. Glenn Sewell, of Crystal City wanted to avoid the road closures around the Mall when ran to work at the Kennedy Center for the anniversary of the March on Washington in late August. The Arlington Memorial Bridge and several area streets were closed, so Sewell hit the Mt. Vernon Trail. He had never run to work before that day but hopes to try it again as part of training for October’s Marine Corps Marathon. Several aspects of Washington make it ideal for running commuting, according to London. There are many parks, trails, and runner-friendly streets to help make your way into the city, he said. “People in Washington have a lot of good running options,” the 29-year-old said. Bethesda’s Stephanie Devlin, a nearly-daily running commuter who blogs for the website theruncommuter.com, said it’s difficult to tell if running commuting has become more common in recent months and years, but says it’s a pretty easy to become hooked. It’s less prevalent in the suburbs where she lives, she said, but she still gets excited when she spots one on the street with the familiar backpack swaying from side to side with each stride. “I almost want to give them a high five,” she said. For those who successfully start running commuting, it can have a positive impact on running. Parodi finds he runs faster without a backpack and the extra weight it means. For those runners who do travel to work via foot, many have unique quirks and logistical issues to work around simply because their ability, route, living, and work situations are all different. London uses a gym about a block from his office to help him. Others use locker rooms at their offices. For those who have neither, Devlin said a baby wipe shower is manageable. Running commuter Jeffery Ugbah said he used YouTube videos to learn how to fold a suit into a backpack. Chaupis brings extra lunches with her on the days she doesn’t run to work so she doesn’t have to bring it that day. Otherwise, only take what you absolutely need, she said. The weather isn’t so much of a hindrance for Chaupis. She typically only avoids running if there’s ice or a serious downpour. But even in warm or frosty temperatures or slight rain, she hits the road. And running doesn’t mean missing out on the positive aspects of the commute. Gaithersburg’s Patrick Benko manages to run to his office by way of the Newseum, where he can take a look at many of the country’s newspapers’ front pages to stay briefed on current events. Washington’s running commuters offered various lines of advice for those interested in kick starting the habit.Plan a good route. Sounds like common sense. Know where you’re going before you leave, but there are several factors to consider such as distance, hills, and runner friendliness. Parodi enjoys taking the many trails from his home in Friendship Heights to work in Foggy Bottom. He also finds it adds more hills to his runs than he would otherwise squeeze it. The routes Devlin takes can vary from 2.5 miles to 5 miles depending on the type of workout she wants. If you live too far away from work, take public transportation part of the way and run the rest. Get your work clothes and items to the office. For some running commuters, this could mean hauling a fresh set of clothes with each trip. Others use non-running commutes to bring fresh clothes and items to the office. Don’t forget a set of clothes for the run home, London says, as those for the run in can get soaked in sweat. Pick the right backpack. Devlin borrowed one from a friend to test out before buying hers. She recommends one with both a chest and waist strap to keep it from jumping around side to side. Websites such as theruncommuter.com often review packs for their readers. Only buy one if you’re really sure you want or need one, London says, noting the high price tag. Remember the weather and season. The extreme temperatures of the summer or winter don’t mean you have to stop, running commuters said. Dress appropriately or the weather and season. Devlin bought a headlamp for commuting after the sun has set or before it rises. Practicing good hygiene. If your office has a shower or locker room, take advantage and use it. Chaupis said many people aren’t even aware their office has facilities until they ask. This originally appeared in the November/December 2013 RunWashington.